Sinatra: The Man and the Music is running at the London Palladium for a limited season from 10th July to 10 October 2015. 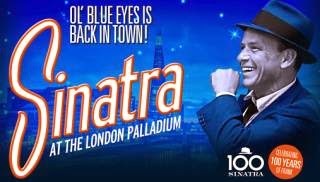 The production will mark the 100th anniversary of the birth of Frank Sinatra, and will take place at a venue which has long been associated with the performer, since his London debut. He first topped the bill at the Palladium in 1950, supported by the famous sand dance variety act, Wilson, Keppel & Betty and comedian Max Wall. He returned to the Palladium in 1975 for 10 shows supported by jazz legends Sarah Vaughan and Count Basie. Described as a "multi-media show" Sinatra: The Man and the Music has the endorsement of the Sinatra family and is produced in association with Frank Sinatra Enterprises. It combines rare and original master recordings of Frank Sinatra with never before seen performance footage, all accompanied by a 24 piece orchestra and a company of 20 dancers and singers.